How are you? What’s your favorite movie? Where are you from? Questions like these are part of almost every conversation. After all, questions are what often keep a dialogue going. Good questions are important in our daily interactions, but in sales, they are crucial. A poor question can kill a deal, while well-worded question will get a potential customer to open up about what is important to them and will allow you to make a value proposition. Open+ questions open the conversation up and allow the other person to answer with greater detail. Instead of closing the conversation off and backing yourself into a corner, Open+ questions allow you to expand the conversation naturally. Follow-up questions become an easy next step instead of a rehearsed and awkward transition. Remember that when you are having a conversation with anyone, prospective friend or client, you are looking to learn more about them, and the absolute best way to get them talking is to use Open+ questions. Start practicing Open+ questions in your day-to-day conversation. It may feel awkward at first, but with practice, you’ll be an Open+ pro in no time. Below is a diagram of everyday questions that can easily be changed to Open+. 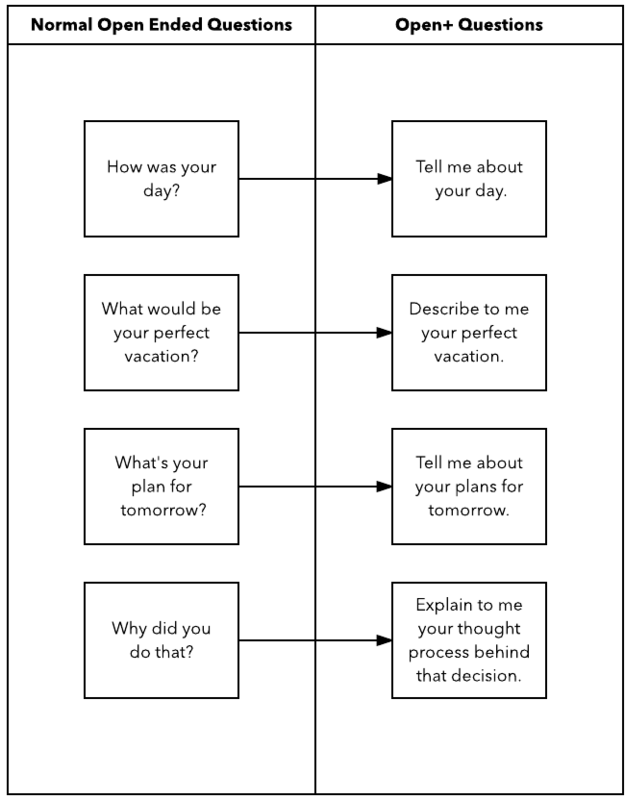 Try swapping out normal questions for Open+ with family, friends, and clients alike. You will be amazed by how much deeper your conversations are and how much more the other person is willing to tell you. When you are on the phone with a new prospective client and are having a hard time getting them to open up, try Open+ to get them talking. When you don’t understand a new process or project, use Open+ to gain a deeper understanding. When you are concerned about a friend or family member, ask Open+ questions. The more you use Open+ questions in your daily conversations, the easier it will get to add them in your prospecting calls. Open+ questions will open your conversation to a new level of understanding, and you will be able to converse on a much deeper level than you have ever before experienced. Try it out—you’ll be amazed by the results.